TV dinners! Mike and I both grew up eating these staples of midcentury Americana, and while we don’t miss them as such, we both have fond memories of them. I liked the Salisbury steak and loved the terrible fish & chips (as well as the fish with mac & cheese), but my absolute favorites were the Mexican-style dinners – questionable enchiladas with totally inauthentic rice and beans… even though they didn’t come with dessert. Mike also loved the Salisbury steak, as well as the turkey and the chicken parmesan (I don’t remember that one!). 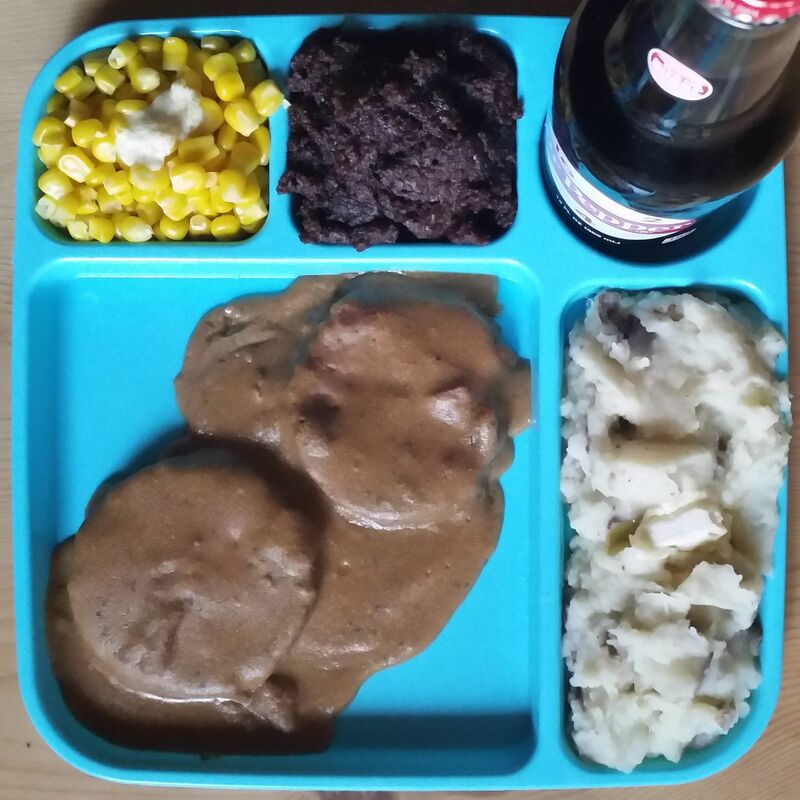 I thought about creating a vegan Salisbury steak from scratch (and I might still try that someday), but TV dinners were/are about convenience and speed, not craft or quality. Cedar Lake makes these great canned seitan “chops” that I bought on a whim several years ago and really loved; we like to keep a can in the pantry for last-minute dinners. 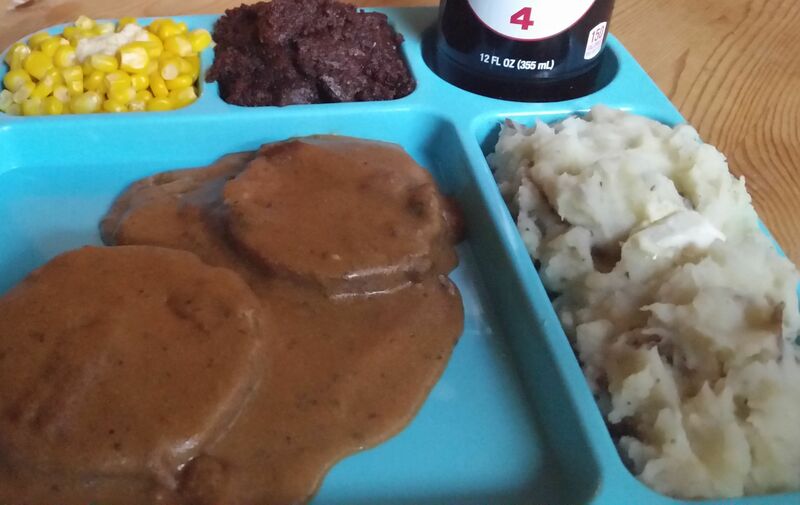 We knew the texture of these would be pretty spot-on for Salisbury steak. I put the chops in a casserole dish and smothered them in Julie Hasson’s Rich Brown Gravy from Vegan Diner (just as delicious and addictive as she claims, by the way), and then baked them at 300F for about 30 minutes. I know that the potatoes should have been peeled and whipped to a fluffy, unpotatolike consistency, or at least potato buds from a box, but I just couldn’t bring myself to do either of those things. 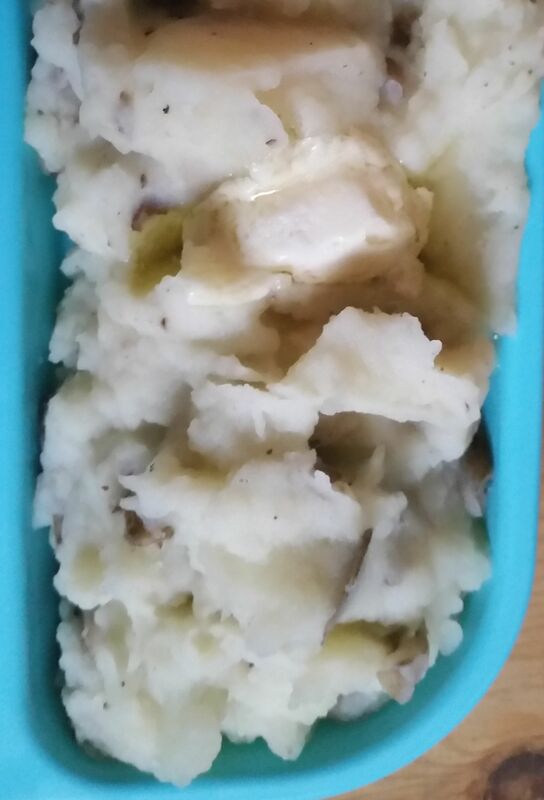 So I made my usual mashed potatoes, skins and all – authenticity be damned! 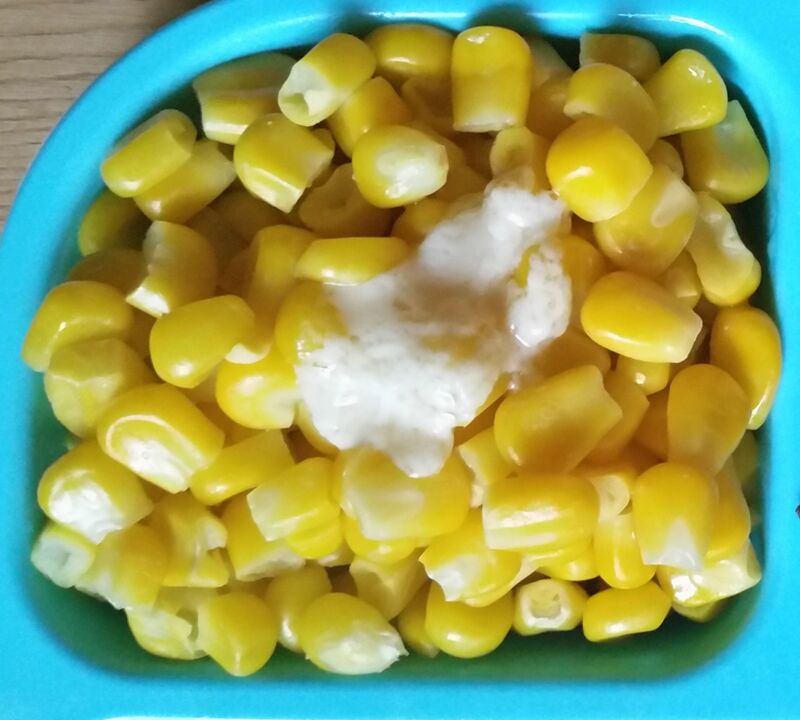 The corn came from the freezer, though. And though we usually do not butter our potatoes or other vegetables, TV dinner always have those little pats of butter. I’ve been a sugar lover from, I don’t know, birth? Naturally, my favorite part of TV dinners was always dessert. Even though it was almost always some terrible brownie that was somehow simultaneously burned (at the edges) and undercooked (in the middle). As a kid, I felt totally cheated when my TV dinner had those stewed apple slices instead of proper dessert, so of course I had to make a dessert for our TV dinner recreation. I tried this recipe for mug brownies, and they were perfect, even if they came out of the mug in a messy heap! And Mike spotted a 4-pack of this “vintage” throwback Dr. Pepper and grabbed it, thinking it’d be perfect for this meal – and he was right. We generally don’t drink much soda, much less soda with dinner (unless it has whiskey in it…), but it was too perfect to resist. 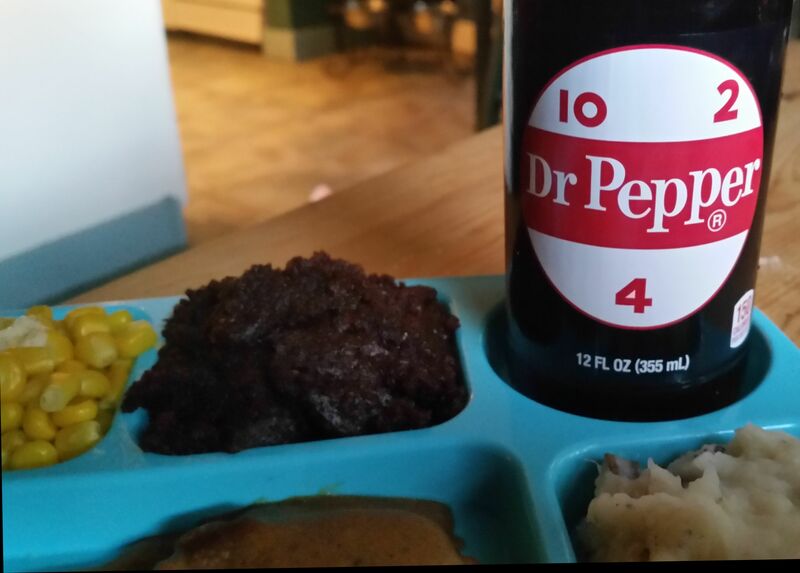 We poured our Dr. Pepper into vintage glasses. And then we added whiskey, to create a cocktail we call Doctor’s Orders. And we ate our TV dinners while watching TV, and it was all perfect. Ha! Now I know what a Salisbury steak is! Love the kitsch of this, down to the ‘Dr’s Orders’ cocktail. 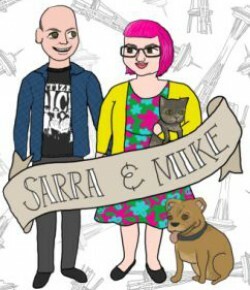 Do you have Sarah Kramer’s vegan cookbooks? I have to admit that the Dr.’s Orders is something I came up with 2-3 years ago and that we probably drink once or twice a month. I grew up in Texas, so when I go for soda, it’s almost always Dr. Pepper; when I started liking whiskey, I thought, “What if I add that to Dr. Pepper?” et voila! It definitely wasn’t just for this dinner! I had Sarah Kramer’s cookbooks when I was a baby vegan, but I never found myself reaching for them as I cooked more frequently, so I gave them away to another baby vegan who needed cookbooks and didn’t have money. She’s got great style!